I and many other activists are working hard to ensure that all of us can ride free in this beautiful state. On January 11, 2016, the legislative session opened at the Arizona Capitol. In attendance were a members of groups who have issues that they want addressed by our state government. One group consisted of about sixty bikers. Members of clubs, motorcycle rights organizations, independent riders, and two business owners whose livelihoods involve supplying bikers with our gear. There was a helmet law introduced and a bill that criminalise video recording of police during their activities. We led the public outcry to kill both bills. On April 18, we had our annual Motorcycle Day At The Dome. Again, about sixty bikers were present. We are engaging with legislators on behalf of the motorcycle riding community in Arizona. 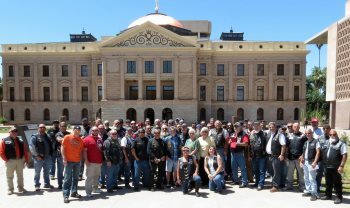 The Arizona Confederation of Motorcycle Clubs (ACMC), the American Brotherhood Aimed toward Education (ABATE), the Coalition Of Independent Riders, the Mountain Motorcycle Association of Arizona (MMAA), the Modified Motorcycle Association (MMA), and the Christian motorcycle clubs are all sending members to deal with legislative issues on behalf of the overall motorcycle community in our state. There are (at last count) 192,000 registered motorcycles in Arizona. All motorcycle owners are old enough to vote as a minor cannot register a vehicle. 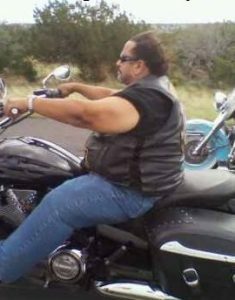 We can have incredible political clout if we unite and decide what direction our state should go in regard to motorcyclists. In the next article I will publish the names and contact information of a number of rights activists. I hope that all readers will contact us and give input about your priorities for legislative attention, I also encourage all motorcycle riders to join one of the rights organizations listed above. Membership gives each organization more clout with its numbers, it increases each group’s operating budget, and it allows them to inform a wider group of people as to events we care about. The Arizona Confederation of Motorcycle Clubs, Inc continues to work in conjunction with like minded organizations and programs to further the fight for our rights, freedoms and liberties. Please take the time and read about this program that is making a difference for our Motorcycle Community.